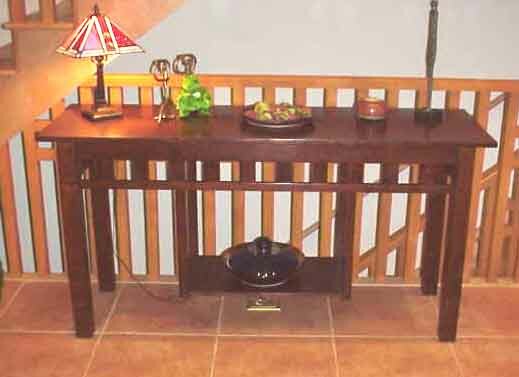 This page contains several End Tables, Console Table and Tabourets made by Strictly Mission in both the Mission and Prairie Style. 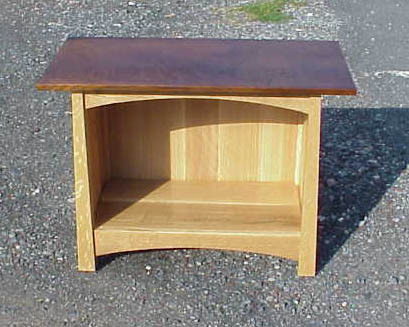 All tables are made to our customers specification so, if you see one you like call and place an order. If you don't see one you like, call us with your specifications and we will work up a price. The top is 16" wide by 25-1/2" long. It is 30" high to match the height of the arms on the settle. Photos of the sectional can be found on our New Chair page as the Prairie Sectional Settle. 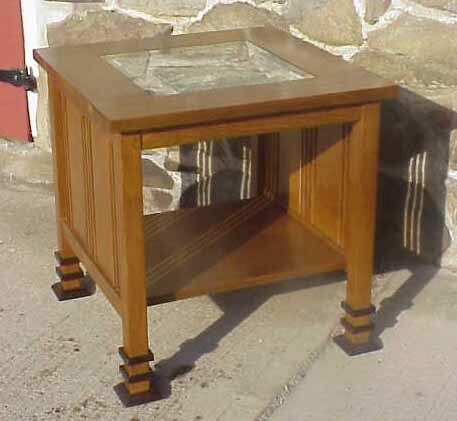 There is also a matching coffee table on the Coffee Table page. 2009 price $1,795.00 including the tiles (you can pick your own designs). Shipping by Fed Ex anywhere in the continential US for under $200 including professional packaging. 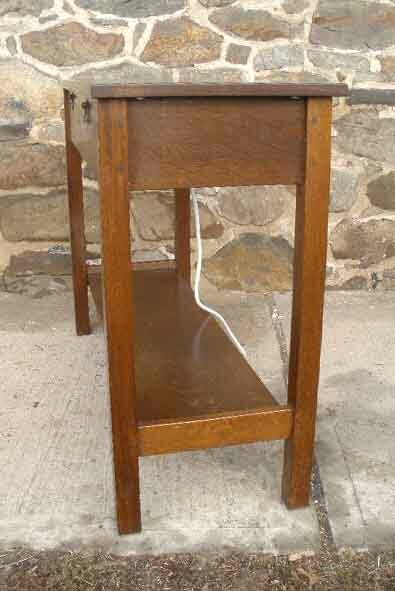 This is a pair of teak end tables with walnut banded legs in the Prairie Style. The tops are 24" square and splined. All structural joints are pinned. The height is 27". 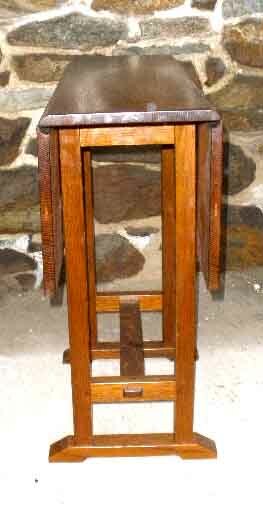 Due to the variabilty in the price of teak, call for prices. 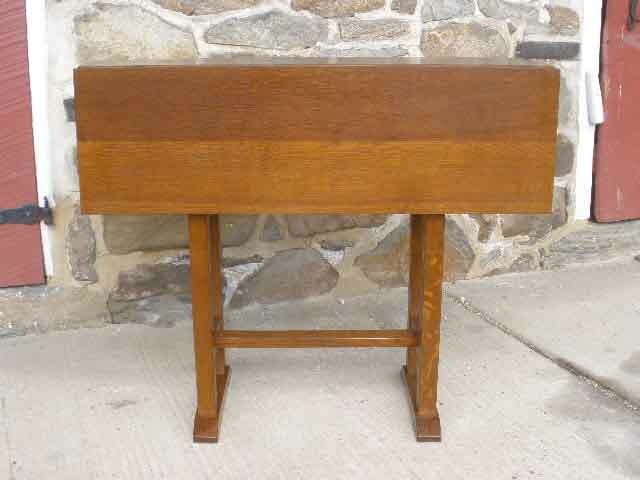 This 48" long hall table is 16" deep and stands 34" high. 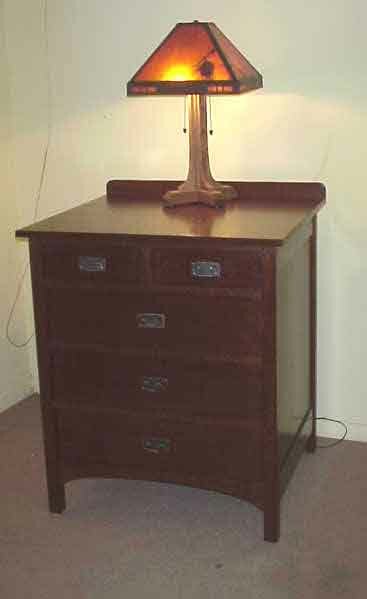 (Left top) The two drawers have reproduction Gustav Stickley hardware. The center shelf is suspended from the frame between the drawers. The quadralinear post legs show quartersawn faces on all four sides. Richly finished with a water based aniline dye and several coats of amber shellac. 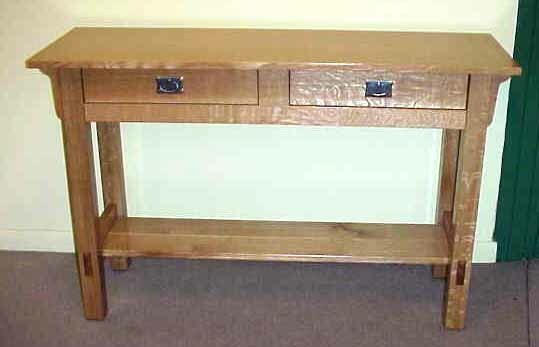 Easily converted to a sideboard for the dining room as designed or with the shelf running the entire length. $1,450.00 as shown; $1,295.00 with full length shelf. 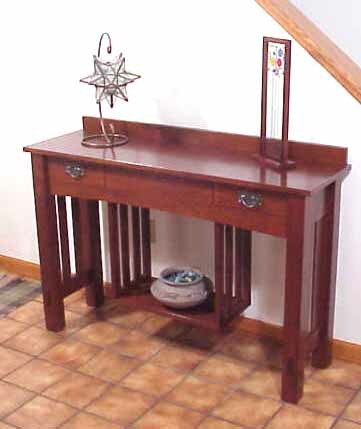 The Console Table (left, middle) is similar to Hall Table (left top) but in unstained natural oak - $1,195.00 (no back splash, no slats on the ends). 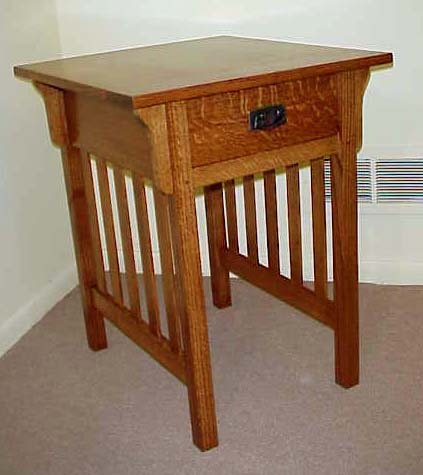 The Hall Table (left, bottom) is similar to the hall table at the top of the column with three differences. This version does not have drawers or the back splash but it has a decorative slat work around the apron on three sides. $1,445.00, $1,495 with back splash. The top stretcher is double pegged and the top is attached with figure 8's. The figure 8's allow the top to be easily removed in the event one of the power strips ever fails and needs to be replaced. Both power strips are equiped with surge procetors. The top is splined along its full length with a 1/16" thick by 7/8" wide spline. The partitions are removable to accommodate larger items or lots of small ones. It also helps keep the cords separated to keep track of which cord goes with what device. 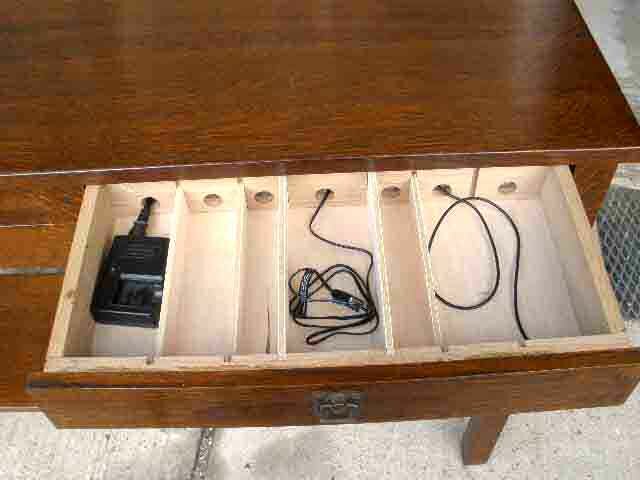 This is a specially designed hall table fitted with 14 (you can have more or less as your needs dictate) charging slots. Under the top are two power strips to plug in all those charging devices for your PDA, cell phones, blackberrys, digital camera battery chargers, etc., etc. 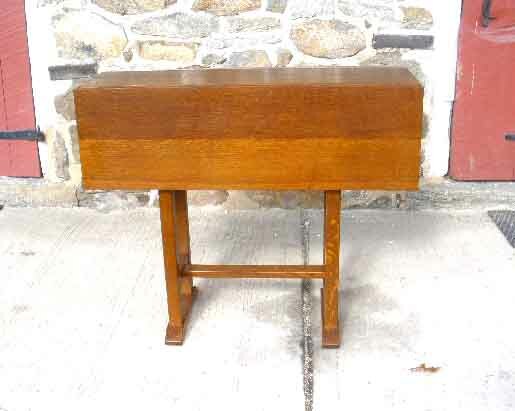 This table is 16-1/4" wide, 45" long and 32" high. 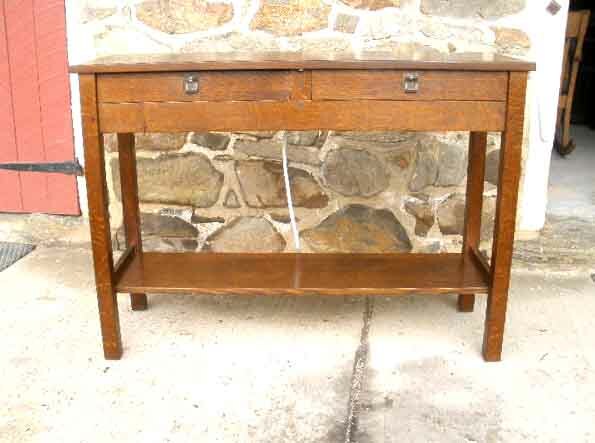 The drawers are 19" wide by 3" high with an interior of the drawer is 7-3/4" deep. 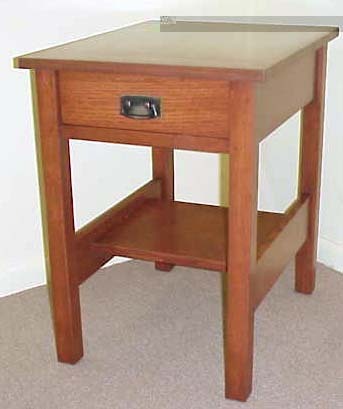 The legs are 1-5/8" square and the shelf is 11-1/2" wide. It can also be fitted with a single drawer or one charging drawer and one plain drawer. We've plugged one power strip into the other (I only have 3 devices plugged in at a time) so you only see one cord hanging from the back. In addition to the power strips there is a shelf below the power strips for the coiled up cords to sit on. $925.00 without slats on the sides and backs. 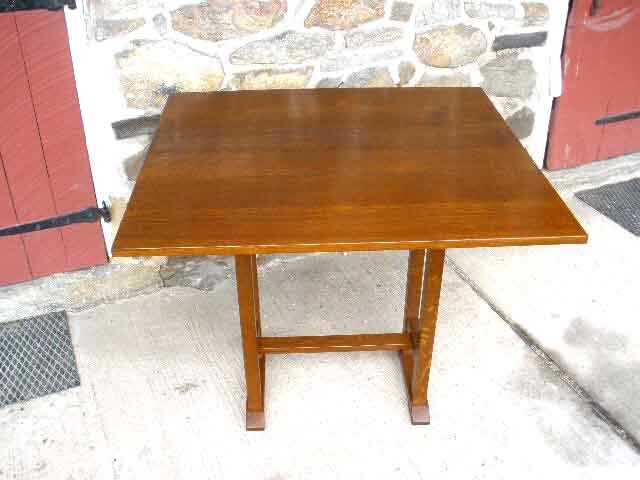 At the request of a customer with great taste we were commissioned to make a copy of a Gustav Stickley Drop Leaf Table, #673. An original was sold at a Rago auction in the fall of 2008. My customer took the auction catalog to the preview and got all the pertinent dimensions. The rest was easy. The original opens to a circular top 36" in diameter. Since this is going to be used to extend an existing table we recommended that the top open to a rectangle, not a circle. 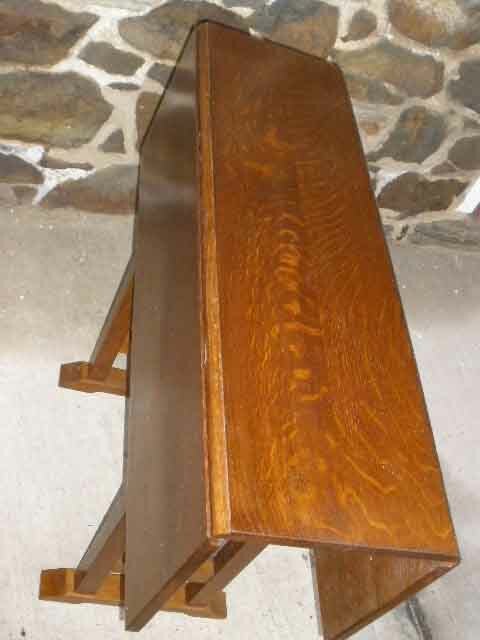 The table is 33" long, the center board is 10" wide and each leaf is 11" wide by 33" long. Opened it is 33" by 32" and 30" tall. 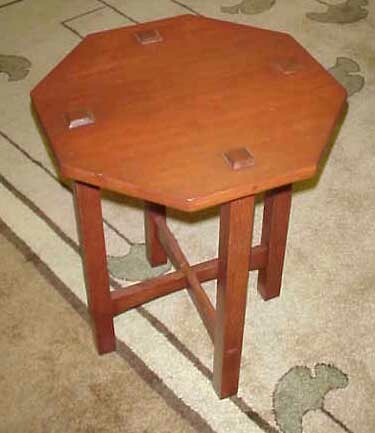 The table was made with the same "spinners" as the original used to support the leave in the open position. 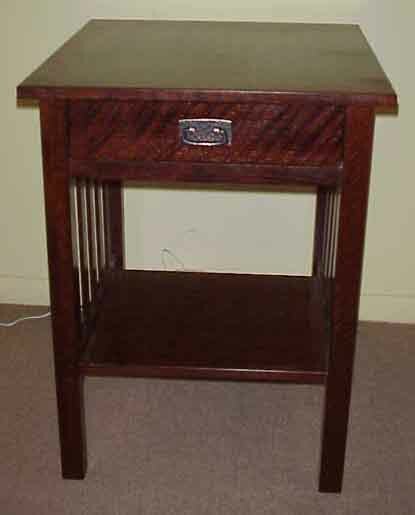 This table is 24" square by 24" high with a single shelf and dark banding around the legs. 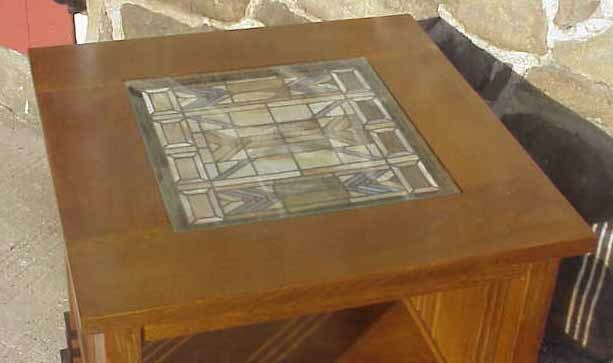 The glass inset is by Quoizel. 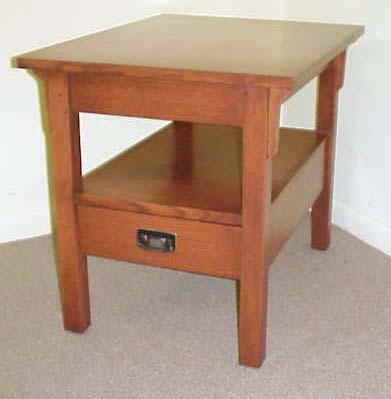 This piece was built as a night stand but can be used or adapted for use as an end table, and with slight modification a shelf can be added. 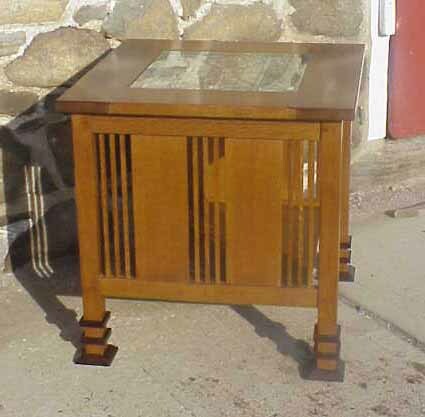 The base is new but the top came from a Stickley Brothers sideboard. The top is 20" deep and 34" wide. The base is 26" wide, 18" deep and 26" high. 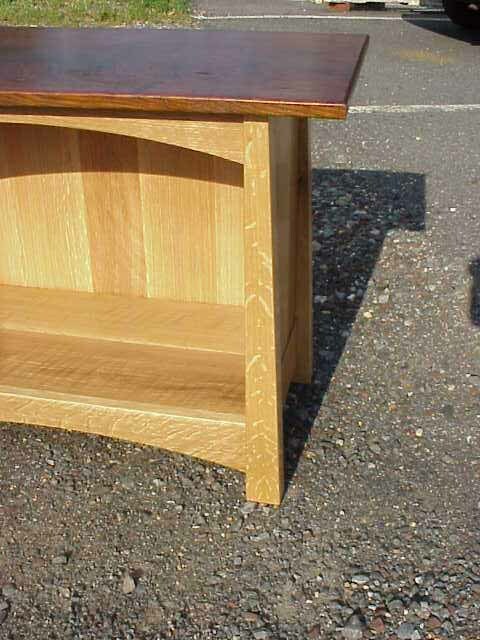 The legs are tapered to the top and the side panels are 3/8" thick solid quartersawn white oak. Future pieces will be made with all new materials (only have so many old tops) in any stain combination desired. 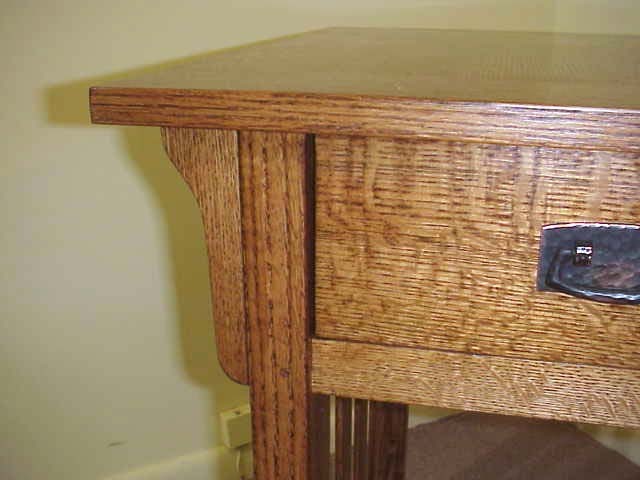 $795.00 as shown, $995.00 with a drawer and Stickley drawer pulls. 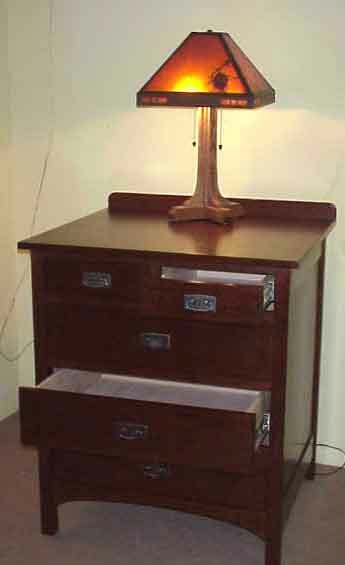 Modeled after Stickley's 3 drawer night stand (#89-910) this piece consists of 3 full width drawers and two half width drawers all with Stickley drawer pulls. This piece is 31-1/4" wide by 28" deep and 36" high with an additional 2" high back splash. 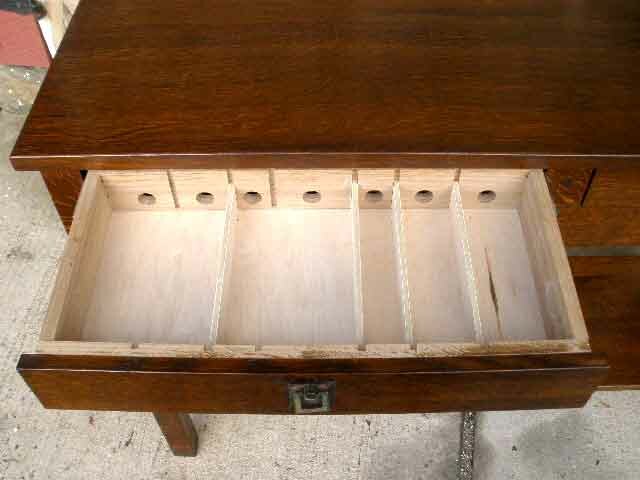 The two smaller drawers are 15" deep and the larger drawers are 21" deep. All five drawers roll on metal rollers with provide easy opening in any weather condition and a positive stop when closed. 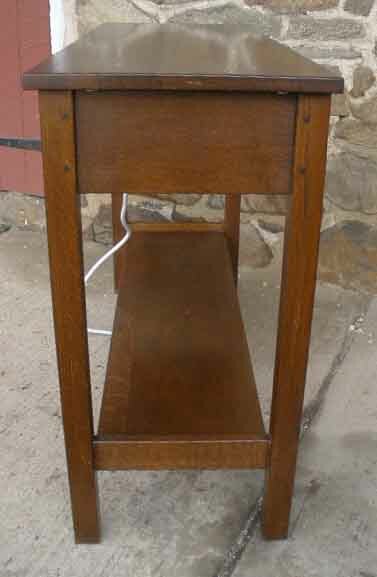 The stand shown on the left is stained similar to Stickley's Craftsman stain with two coats of clear shellac and waxed. 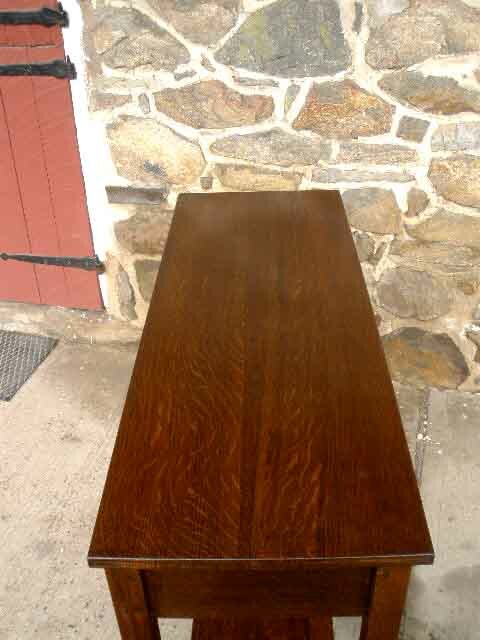 The slated sides on this table give it a little more style than a similar table with out slats. The top is 22" wide by 24" deep and the drawer is 13" wide. All structural joints are pegged. 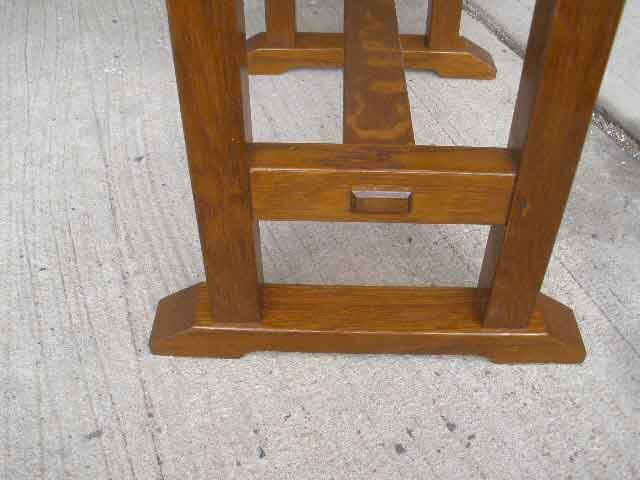 These were designed for a customer in California who wanted two tables but not exactly alike. The table on the left was 24" wide by 24" deep, the one on the right was 18" wide by 24" deep. $400 to $500 depending on size, hardware and finish. 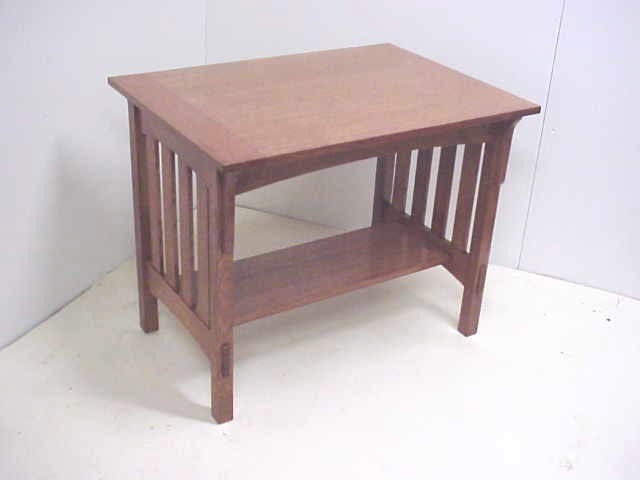 Similar to the tables to the right at 22" wide by 24" deep and 29" high this table has both a shelf and slats with Stickley hardware on the drawer. It is priced at $595.00. Almost the size of two end tables, two of these tables were designed to sit at either end a large sofa. 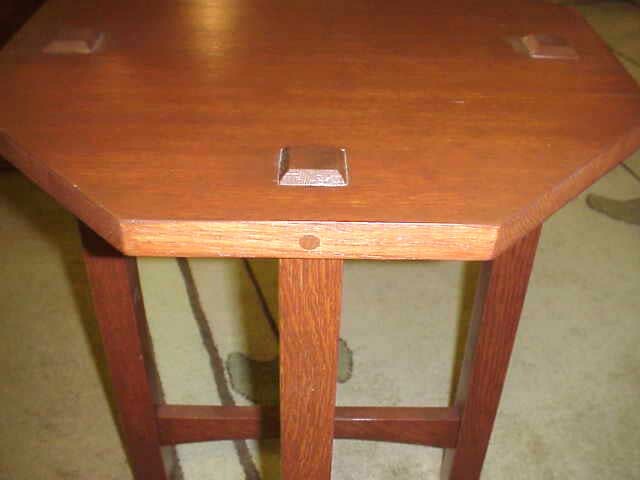 Instead of a drawer these tables have an arched apron on the front and back and through tenons on the stretchers. 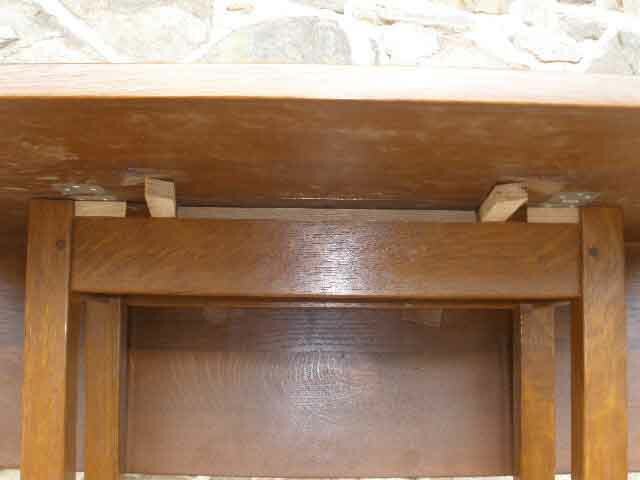 Long corbels add strength to the support the top. $485 to $510 depending on size and finish. 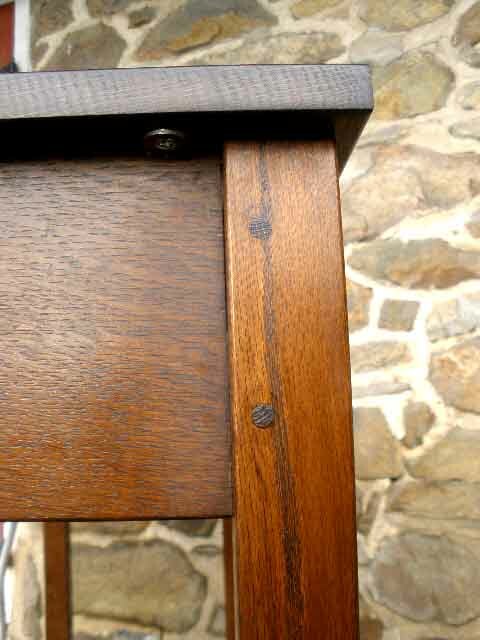 This tabouret is similar to the L&JG Stickley model #559. The table top is pegged to the four legs and the legs are pegged to the thru tenons of the stretchers. The stretchers are lap jointed where they cross and pegged from the underside. 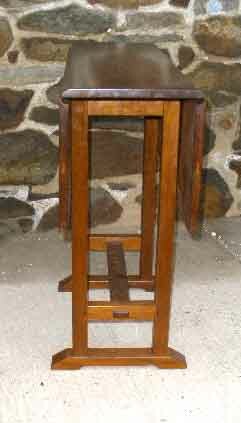 The top is 18" across and it stands 22" high. 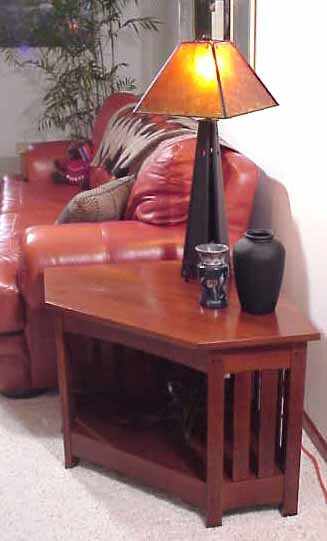 Each table has a shelf and slats on the ends of the coffee table and sides of the end tables. 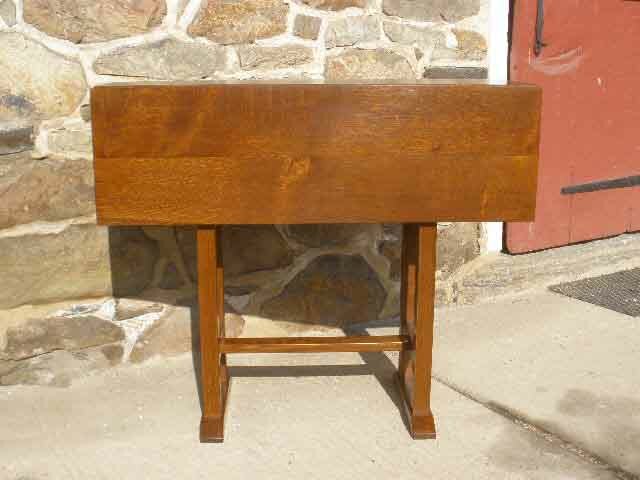 Made from solid Pennsylvanian Cherry with a clear finish. 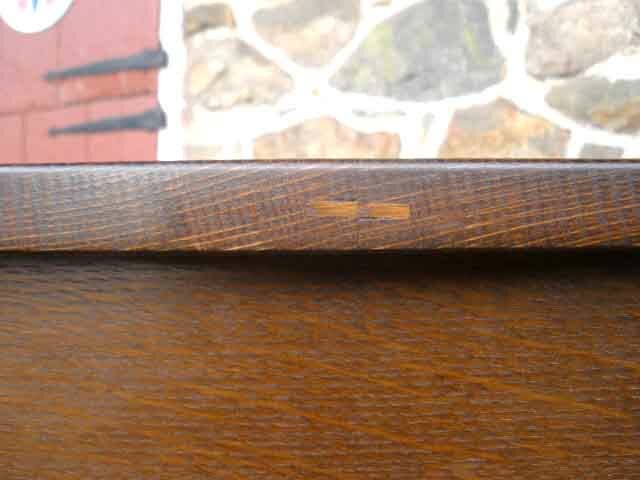 Pegged mortise and tenon construction. 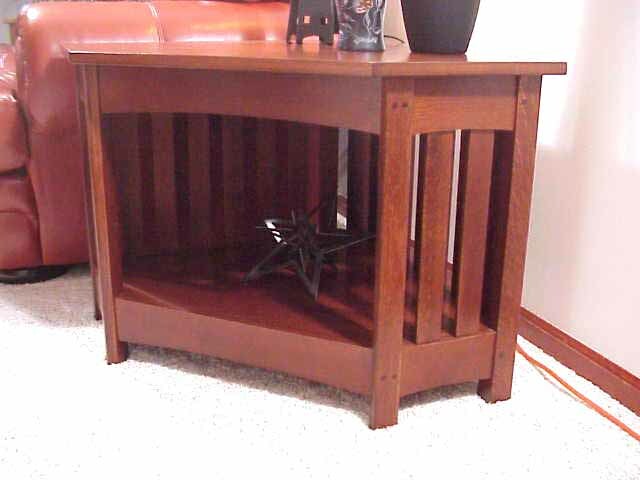 End Table: $515.00 No drawer, full width shelf and slats on the sides. Not stained.